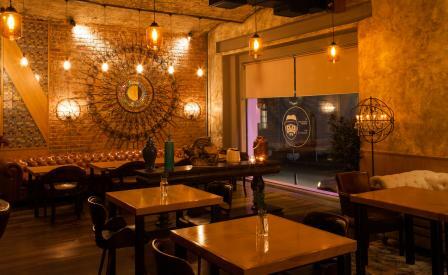 Despite Russia’s food import ban, Moscow’s restaurant scene continues to boom and can now add a top notch Lebanese dining room to its internationally diverse collection. Owner Eduard Starikov tasked designer Igor Satiskov with shaping the interiors, which featuring glass-blown pendant lighting, ornate framed mirrors and turquoise ceramic vases, is evocative of Beirut’s heyday. Wooing head chef Basem Zai from the Middle East, the menu includes classic dishes from charcoal grilled lamb kebabs to tasty shawarmas inspired by his grandmother’s home cooked food. Preparing his own cheese, pickles, sauces and bread, Zain uses all local ingredients, bar the rose water, which he brings from home. The wine list includes a selection of Lebanese labels, but it’s the araq-based cocktail with grape and spices that is the biggest hit at the bar.